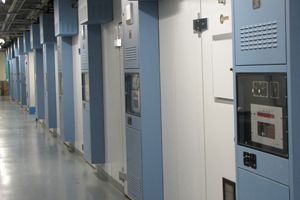 The CEF consists of 183 environmentally controlled reach-in cabinets and walk-in rooms that can be programmed to produce various environmental conditions, such as qualities and intensities of light, ranges of temperature and humidity. The cabinets and rooms are available on a rental basis to clients within and outside of the University. The CEF is approximately 30,000 sq ft with approximately 8,300 sq ft being chamber space used for growing. The rest of the space is general workspace and labs. The chambers range in size from 7 sq ft to 178 square ft. There are 150 controlled chambers located in the main area and another 33 controlled chambers located throughout the Agriculture Building. The CEF recently concluded a $12.5-million major upgrade with the addition of energy efficient lighting as well as updated chilling units.